I'm starting to scrape the bottom of the barrel here. Hippogriff's skill activates when you Drive Check a Grade 3. You then gain 5k power, and Time Leap one of your rear-guards. But also pretty chance-reliant, and only gets less useful the longer a fight drags out. Just to show that anything no revolving around Chrono support is fail. A) In Dimensional Robo, you break through P-and G-Guards, which would be downright broke if not attached to a heavy G3 chance-based mechanic. B) LB4 Asura Kaiser can restand himself as well as one unit, which was a good punch in LB format, and Stride Asura can restand your whole board, which is better than just refreshing one unit. C) The newest Raindear can both reride and gain an extra drive check. D) A and C (and B in extreme fight) have non-G3s that will count as G3 when you check them, and those units themselves have other utility. Chronojet and Chronofang do a great job at Time Leaping without relying on checking Grade 3s, making Hippogriff wholly unnecessary. 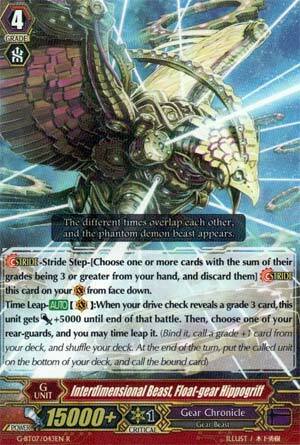 You'd have to run at least 10 Grade 3s to reasonably rely on Hippogriff, but hey, at least Uluru could recycle those back in the deck. Metallica Phoenix and Warp Drive Dragon simply make Hippogriff mundane. There were two units in G Set 5 that could Time Leap themselves if you checked a Grade 3, but at least they had Resist. Hippogriff provides no such utility. If you happen to think Gear's Clan Booster will do something for this card, you're more optimistic than me. Gift this to a kid at locals who needs G-Units.